Thanks for the hint. Have looked at command-line options page. Have set dx9single and forward rendering. Looks better. I have a weird issue, if i right click and try to move the camera up and down, it doesn't work. It's like the right click is locked on the X axis. Does anybody know any fix? I searched in the options, but there doesn't seem to be a "lock camera on X axis" option.. so i think it's a bug. If i tick the "Use scrolling gestures to switch direction" option, i can scroll on the trackpad and it moves the camera up and down.. but it's really weird to do that while using a mouse. Subtitles shown during cinematics now scale appropriately when the window is resized. I have had nothing but better and better game play now with the MAC 64 -bit client. Between this and Apple, who I sent copies of all crashes etc. I have rarely experienced any lag nor crashes. It used to be, I could not run with a squad in WVW because it would just slow down so bad, like flip cards for old cartoons. Anytime there were large groups of people in any area I avoided them to be able to keep playing. I was never able to run Team Speak and GW2 at the same time or CRASH. FYI I also play only with mousepad! I have a pc which I can play on as well but I am useless with the mouse! New Macbook pro laptops ..... I wonder how they will perform with GW2? I just recently started trying to play again, after giving up nearly 2 years ago. Coherent host crash on login screen still happens nearly 30% of the time. I'm a software developer. If I had an application that crashed as frequently as this, I'd have identified the problem within a day, and probably fixed it soon after. Crashes to desktop still occur several times per day for me. Especially in the newer zones. Sometimes I get a message that the crash info has been sent to ANET. Most times not, though. But still, it's often enough that if I was a developer, I'd be running this kitten thing in a debugger so that I could figure out what was going on to cause crashes this often. It's sad, because if I ignore the time that I've spent trying to re-log into the game after a crash (after invariably missing out on an event that I was participating in), and the rewards I've missed out on, I'd enjoy the game. But instead, it's incredibly frustrating, and I'm thinking that I should instead spend more time on games that have a stronger commitment to OS X support. You are using the 64 bit version, right? Most of the complaints I and others have about it fall into non-blocker status: slowness, graphics glitches, and the like. The only time I have had an actual crash with the new client have happened when everyone (no matter what platform they were on) was having them. The 32 bit client was crashtastic though. Even on the lowest possible graphics settings it was 50/50 that I would crash if too many people were around for something. If you are on the 64 bit version you might have a corrupted copy somehow. Either run the fix instructions on it or just delete and redownload (actually the latter is probably safer). If that does not fix it do the usual and look if there is anything else that might be causing a problem. Hardware that does not meet anet's minimum specs? An OS version years out of date? Trying to run over wifi rather than using ethernet (that causes a lot of dropped packets which crash game clients)? if arenanet ever adds vulkan 1.0 support, they can practically release a wine port with better performance and fewer bugs than the native client. for everyone who has issues with wine, the technology is better than you think. Idk what I'm supposed to do if the client is broken to the point directories are missing. I would just redownload the game, but we have moderately slow, capped internet. My monthly allotment is ~13GB before being relegated to DSL speeds. You are still using the old client. You should definitely download the new one, which uses the data files from the old client so you might not have to download the game again. Intel Iris Pro 1536 MB -- GW2 on an iMac. Good fps, everything is A-OK.
That's... correct but bizarre... I distinctly remember downloading the 64bit, and the 64bit has library files and remembered my old password, I have no idea how it got deleted/overwritten. Thanks! Anyone lucky and wealthy enough to play GW2 on the new 4-core and 6-core MBP yet? Or even with the Blackmagic Thunderbolt 3 eGPU? It seems apple itself is the main source of the new MBPs right now so that may be the slowdown, even the big stores still say they are pending. If my preferred source (Small Dog Electronics) does not have the 15" models later this week I will give them a call to get an ETA. The eGPU most likely will not be a help in most cases. Even on my 2013 iMac guild wars is CPU bound rather than even touching the GPU. I have GW2 installed on an external SSD connected via thunderbolt 2. I turned on High-Res Character Textures and Vertical Sync. Using an external LG 5K monitor (thunderbolt 3 connection) with the built in graphics running at 1920x1080, I can get around 25 fps in a sparse map and around 14 fps at the flax farm in verdant brink. Using the Blackmagic eGPU, framerate goes up to around 45 or so on a spare map and manages to hang around 30 fps in the flax farm. My methodology for measuring probably isn't the best as I'm eyeballing the FPS report on the options page. It does feel noticeably smoother with the eGPU, but there are still times when I'll have momentary hitches when rotating the camera around. I haven't tried anything more extensive like WvW or even Lion's Arch yet. 1) The GW2 client appears to have some kind of bug if I try to run it on the external 5K monitor with the laptop monitor also open. The displayed area appears to be the main laptop monitor size and pushed to the bottom left corner with red screen for the rest. The mouse inputs are still responding as if it is a full screen clicking on menu items is a challenge. If I close the cover so that the external monitor is the only monitor, then everything works and is sized correctly. This was how I did my comparisons. 2) The eGPU by default will be used to drive the monitors that are connected to it. So if you just connect it, it will not drive the built-in laptop monitor. It's possible to change some OS settings to make it drive the internal monitor also, but I had a hard time evaluating if this was improving the framerate. It was certainly not as good as the external monitor, but it also seemed better than the low 14 fps that the options page was reporting. I don't know if this setup was causing the options FPS report to be inaccurate. 3) The eGPU comes with a really short TB3 cable (1.5 ft). It looks like in order to get the full bandwidth over TB3, the cable length can only be this long. A longer 3 ft cable has half the bandwidth rating. This made positioning the eGPU with my current desk setup a bit of a challenge. Overall, I'm pleased to be able to play GW2 this well in MacOS. I had been previously using an older MacBook Pro with bootcamp and the eGPU will let me retire that system (and reclaim some desk space). Thanks, I did not expect to see as much difference. On my iMac it seems all the graphics are going through the intel chip. That is strange about the cable though as the LG 5k monitor comes with a 2 metre one. Follow up about the bug, I figured out a workaround. The bug can be seen here https://imgur.com/a/ADqneRL One image is running on a 5K display and the other is running on a 1920x1080 display. The workaround is to go into Display Preferences > Arrangement and assign the menu bar to the display that I want to run GW2 in. This lets it launch with the correct resolution. Ever since the update (July 24 2018) GW2 completely crashes only a minute or two into the game. I have a macbook pro, i7 processor, and run most of my graphics settings on low. I was able to play fine yesterday but not after downloading the update today. I'm unable to make a custom soundtrack function on the Mac Client (64bit). I followed the instructions exatly (here https://wiki.guildwars2.com/wiki/Customized_soundtrack) and even tried several playlist formats as my wife on her windows PC was able to get a PLS playlist format to work for her. I suspect it is a bug causing it not to work on the Mac as I have gone through everything listed in the wiki over and over to get it to work. I realize this is not on the level of a game crash, but it is a potential bug. Any assistance you can provide would be appreciated. I have not even used the game as a music player since the first week. I designed custom soundtracks in itunes. Not only does this give me control of which of multiple soundtracks to start at any given time I also do not have the soundtracks change just because I changed zones or the like. I just wish there was a good way to query information about my session (like what character I am on) so I could use that to start the right one but eh. Is anyone else missing their function keys on a MacBook model with Touch Bar since the last patch? You mean you actually want to use function keys rather than the emoji-like hell apple is forcing on us? I assume you have tried going into the control panel and setting function keys as the default? Looks like I will be looking for a foldable keyboard to put in my laptop pack. Nope, they were there with my settings unchanged and then they weren't. The latest update just brought them back. Thanks for the quick fix ! After a year not playing Guild Wars 2, I thought I pick it back up again. In the course of this year I bought a Macbook Pro. I would have thought this would work fine as Guild Wars 2 is now a mature game. Unfortunately, my FPS is horrendous. In LA I have a FPS of around 30 while standing still, if i dare to move it will drop all the way to 12. In an area as Gendarran Fields I can have an fps of 73, but only if the camera is moved, it can drop down to 20 something. Can someone tell why my FPS is not stable, and better, can someone tell me how to fix this issue? A lot of things go into the fps plus you will see a scene rendered in what is considered 'ideal'. Say you were out in the middle of nowhere with no objects in draw range around you and you were not moving, the fps will jump up (actually the ideal is pretty low but usually you will see something high). Now go to a busy city and your fps will crash into the ground. because there are many more things to render Most of the time you are between those two extremes though. I have serious problems of lag during the game even with the lowest graphic settings. I'm on a MacBook Pro (Mid 2015) with High Sierra. I have a 2.2 GHz intel core i7 with 16GB of memory and an Intel Iris Pro 1536 MB. Is it possible to fix (at least a little bit) the problem? I came to tell how well the client works for me by now. I had to play on all low settings when the client was released and have a frame limiter set to 30 FPS. It rarely hit that limit when the client came out but I noticed yesterday that it was basically stuck to 31 FPS no matter what I did so I started bumping up the settings a bit. I now play with all high textures and high shaders on. The only thing I did was lower the resolution to 1650x1050 (which still is close to 1080p) and disabled DPI scaling. This is amazing and I love how you are constantly improving the client bit by bit with small steps! It does lag the first few Minutes when I start the game but gets smoother and smoother the longer I play. I assume that it takes a while until the engine loaded everything into memory and renders stuff? I can only speculate though. I also still have flickering leaves on trees and bushes. I'm happy to provide additional debugging help if necessary. Quick question: Base macOS Sierra, or updated to macOS High Sierra? I updated to High Sierra, but I have an SSD anyways so the high I/O Problem wasn't that much of a deal for me anyways. However, I just checked and after 10 Minutes of playing I had around 130MB of Read and Write. So seems like that problem's solved?! I'm playing on an iMac late 2012 (i7, GTX 680 2GB). The performance definitely got better a few weeks ago. I still have this input/movement lag where it feels like my character is walking through goo but it's gotten a bit better. I'm playing on mid to high settings. Textures, shaders, animations and environment on high, shadows medium and player visibility and quality depending on content. Decreasing these settings doesn't really help with the FPs. I'm usually having 23-40 frames. If I decrease them I may get around 60 but only while standing still. Moving will always decrease them below 30. Something that is the biggest performance hit for me is the resolution of my display. I always have to play in subsample otherwise my fps will never go above 30 even in lowest settings. It doesn't look that nice but I personally prefer the subsampling to not having any shadows or shaders. Recently I bought an external SSD. The FPS got slightly better but the noteworthy thing is that my loading times are literally never above 10 seconds. Loading into mistlock takes maybe 4 seconds. It's amazing. I just copied my GW2 folder to the SSD and it's working perfectly fine. Because of these decreased loading times the UI also doesn't need time to load. While on my internal HDD, every UI element needed 3 extra minutes to load. Opening the inventory took two more minutes to load every item icon etc. This is my recent experience with the Mac client. It's great to be able to play it without having many problems anymore. Only the flickering textures are something that really buggs me currently. Thanks to all the devs! I agree, SSD is the way to go. I'm also on an iMac; Late 2013, 16 gb memory, GTX 780M, i5. It runs good on medium to high settings, 25-50 fps mostly. Still have a stutter when moving. It really shows when playing a Vista. I hope they can get this fixed but overall it is sooo much better than before. Fixed some of the issues relating to light rendering. Things getting better for every Mac GW2-er? Hard to say. I'm assuming this means I won't be seeing walls/floors that oddly go all green or all red, but since that was an occasional thing instead of constant, it will be hard to identify whether it's the case. How do we deal with mojave btw? do we install it on the next week? Also - Thats sad also that @sunrun still didn't get an answer about touch bar.. Since the last update I occasionally have green people running around. You can see it in the attached screenshot. It also includes the flickering problem that was reported before. The leaves lose their texture for a split second and then they reappear causing the flickering. EDIT: When I started the game today, it told me that it found corrupted files the last time and asked to repair the data file, that fixed the green people. inaho.2046 posted about this back in July, but I wanted to bring it up again- the custom music playlists don't seem to work on mac. I've been trying over the last week to put in a MainMenu playlist, but it never plays. I've tried both .m3u (extended and non-extended) and .pls playlists, and I tried sourcing the files from a nearby directory (I put a "tracks" folder on the same level as the "music" folder) as well as from the iTunes music folders. Yes, it's not game-breaking, but it would be really nice to be able to do the same things on mac that can be done on PC. If you could fix/implement this soon, it would be much appreciated. Hmmm, might not want to say 'fixed' too soon, I saw some seasick-green charr wandering around today in Plains of Ashford. So, today macOS Mojave is out. 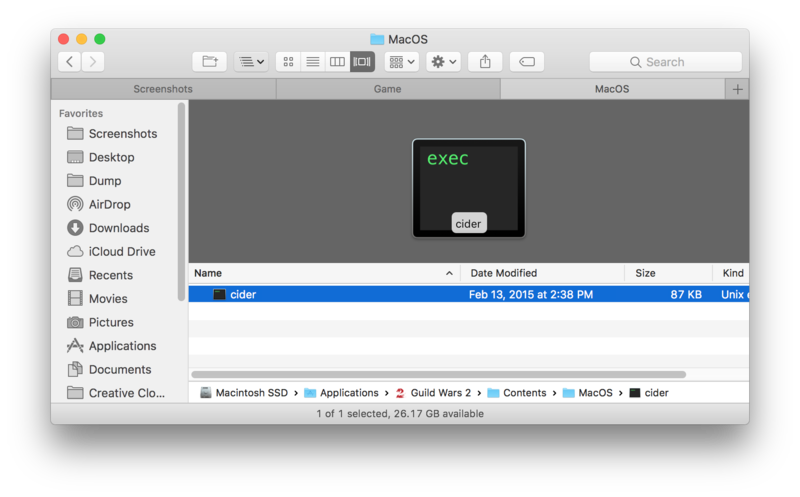 There are several BIG questions regarding new Mac, new mac OS, with GW2 Mac 64-bit client. Not sure which newest Mac to get, yet thinking of the new MacBook Pro 13 inch touch-bar with quad core, or the 15 inch touch-bar with 6 cores + dedicated graphic chip. Is the Touch-bar still useless with GW2? Have macOS Mojave fixed this? Or, will this be fixed eventually? Or, is Touch bar a gimmick. Does GW2 run nicely, or even better on macOS Mojave? Does GW2 run nicely, or even better on the new more-cores MacBook Pros, either 13 inch or 15 inch? Being able to play GW2 on a Mac (in portable or small form factor), and with better output, is key to what I am going to do next with my new Mac purchase. I know everything else will definitely be better than what I have right now, which are getting too old. Any useful and constructive info, and kind suggestions, are very much welcome! Just a quick note that GW2 runs fine on Mojave for me (late 2016 15" MBP w/TB, Radeon Pro 460). I seemed to be getting a few extra fps where my character was left compared to when I last logged in, but that might just be differences in players. Still as janky/hitchy as ever when rotating the camera/whenever it loads new assets though. Edit: Forgot to mention that the Touch Bar controls are now back for me as of a recent GW2 update. I upgraded to Mojave on my laptop. No significant speed change from high sierra (around 20 fps). So not quite sure what to do about my sierra iMac as I expect it would take a nose dive with either version. Around 6 years older but runs at 40+. Maybe there is some pref setting (in or out of the game) that would help?